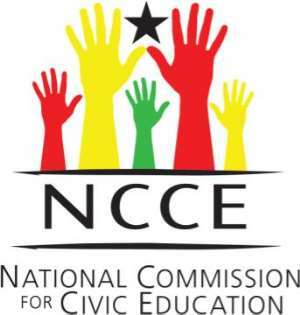 The National Commission for Civic Education (NCCE) has upped its effort to awakening the spirit of self-help - to get the people to do more themselves to better their living conditions. Ms. Margaret Konama, the Kumasi Metropolitan Director, said the communities could not continue to over rely on the government for their every single development need. It was time the people accepted to make sacrifices and pulled together to make things happened, she added. She was speaking at a meeting with Akwamu Division of the Kumasi Traditional Council held at the Asafohene's Palace as part of the campaign to rally the communities to take the initiative to bring development. Ms. Konama said it was important they took steps to improve environmental sanitation - to keep the surroundings tidy. They should additionally complement the crime fight by establishing neighborhood watch committees. The NCCE Metropolitan Director said the expectation was that the chiefs would provide the right leadership to speed up the socio-economic development of their communities. They should go the extra mile to inspire those they were leading to actively participate in communal activities in their various towns and villages. She also spoke of the need for them to constantly engage the people to get them behind their development vision. Nana Kwabena Boateng, the Asafo Twafohene, pledged to put progress of the people at the centre of everything they did.